The woman points toward an unimpressive house adjacent to the recently constructed gas station parking lot. The cement extends toward the house before breaking up, exposing thick grass that rests upon a lanky, wooden fence that obscures the view of the yard. I tell her that I work in a hospital up the road about 100 kilometers and see a lot of patients who abandon their treatment early for various reasons and end up dying from the complications. I’m taken aback by the sight of it. A familiar symbol (above) is painted above the entryway to the church: the thick, black cross with the red cloth resting upon the arms. The words Igreja Metodista are painted above the symbol. 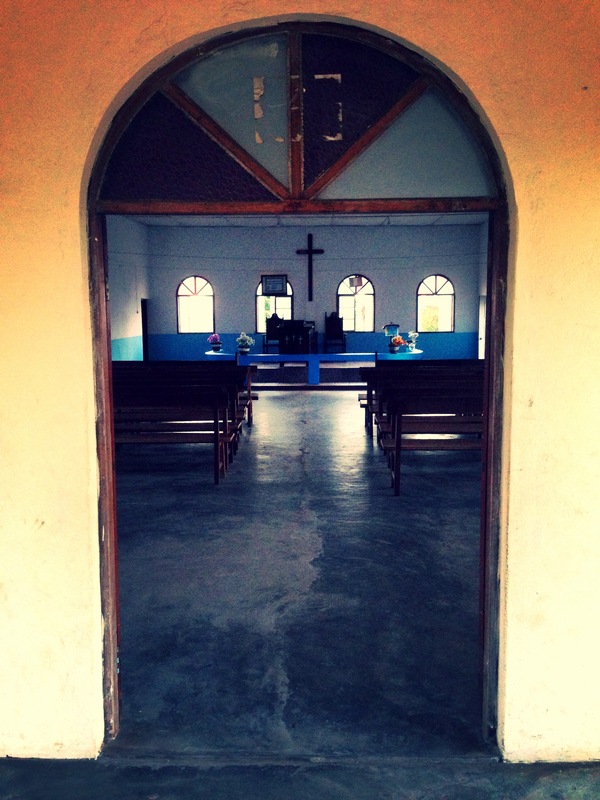 Until this moment, I had not seen a Methodist Church in Mozambique. Sure, I’d seen places of worship for other beliefs – Muslim, Catholic, Evangelical – but this was different. This was personal. It’s a few days before Christmas Day, and I’m visiting close friends in the southern province of Inhambane in Mozambique. I take a moment to let the sight of the church sink into place before continuing on to my friend’s house located next door. A few days later, I excuse myself from my group of friends and head toward the church. I expect to encounter life and jubilance and, instead, am surprised to find the church completely empty. The front door is propped open, and the wooden shudders that act as windows are spread wide, flooding the interior of the church with the remaining light of the day. I slowly move through the small church, taking in the familiar and appreciating the unfamiliar. Long, wooden pews stretch in rows through the room. Tucked in the back of the pews are hymn books. I brush my fingers along the smooth wood as I pass toward the front of the room. Each window I pass reveals something new: a child running past, thick trees producing fruit, the sun setting in the distance. I find myself at the front of the room looking down at a table adorned with flowers, books, and pieces of cloth. In front of the table is a podium. I let the image of a packed church fill my senses. My phone buzzes in my pocket, and I turn it on to find messages from home wishing me a Merry Christmas. It didn’t feel like Christmas before, but today it does. I sit down in one of the empty pews, lift a hymn book from the back of the pew in front of me, and I open it to a random page. I tuck my nose into the crease of the book and inhale deeply, pulling from the book a familiar scent and welcomed calm. I’m standing next to my father in a packed worship hall with the rest of the congregation. We are all singing a hymn while the pastor and co-pastor walk up the aisle and out of the room following the service. I notice that nobody is really singing, and I strain my voice to match the volume and pitch of those around me. I know I can sing better, but I don’t try. I’ve been going to church with my father and siblings for as long as I can remember. The church is a beautifully constructed building tucked in my small town in my small state. The triangular, main worship hall is home to a towering plate-glass window that stretches from the floor to the highest point in the ceiling. In front of the window is a sizeable, wooden cross that hangs high above the heads of the congregation, held in place by chains. The pastor stands below this cross in sermon, and during each service, it’s hard not to worry that one day the cross will fall. It doesn’t. I grew up in the walls of this church, attending summer programs, joining my family for Sunday and holiday services, and volunteering to help younger kids. Some of my closest friends grew up in the walls of this church. Some of the cutest girls in our town attended this church. Each Sunday, I would scan the room looking for a current crush. We follow the congregation out of the church and head for our car. We won’t return to the church until the following Sunday, but that doesn’t mean that I leave everything inside its walls. Each night as a teenager I find myself praying in a similar routine before I sleep. Using the same script but splicing in names of people or concerns of the week, I fold my hands together, close my eyes, and whisper my message into the world. I don’t know who’s listening, but I have hope, optimism, faith that someone is. The document is opened on my computer at my desk, but I’m staring out the window. On the opposite side is a row of bushes and a patch of grass that stretches to the cement parking lot. A grasshopper has landed on the window. I rise from my seat and get closer to the window to look at the colorful details of the insect, but it jumps away as I approach. The next day I decide to quit my job at the bank. It’s a great job working with friendly, passionate people, but I didn’t share the same passion for the work. Something inside me had been leading me to this day, shaking at me and alerting me to a life unlived. I pack up all my belongings and make the drive from Nebraska to Washington State. During my two years in Seattle, I spend my Sundays at a middle school located close to my house that hosts Mars Hill, a popular Christian congregation in the northwest and west. The group isn’t without controversy with some members calling the group a cult and denouncing the church’s leader, Mark Driscoll, for his sometimes radical practices. For me, the group is a place to find the familiar calm felt growing up. While that calm had since been replaced with stress, sadness, insecurity, and uncertainty, deep within my soul was a faith that everything will turn out fine. I continue to spend my days living with this notion in my heart, although my faith has always been a private one. Looking back, the decision to leave Nebraska saved my life, but whose decision was it? For the longest time (and still today), I knew it was my decision, but I also know that it was driven by faith, a belief strengthened through the church. So I ask again, whose decision was it? I’m sitting with a book in a restaurant in my small town in Mozambique. A doctor friend who is visiting from the provincial capital to work with cataracts patients in my area approaches my table. Behind her is a short man with a large smile on his face. “Nice to meet you, father,” I say and extend my hand. He continues to tell me that he’s been living in Mozambique for about a year, is originally from Mexico, and wants to learn English because he has family in Scotland. I tell him that I’m happy to help, and he leaves the restaurant thanking me numerous times. A few weeks later, the father contacts me and says he wants to have lunch with me at his house. Joined by another volunteer from a nearby town, we head to the church and meet him by the main road. He leads us through a set of large, metal doors that lead to his house and main yard. He tells us that 14 young boys work with him at the church, and that with time they’ll be able to preach as well. My friend and I meet a couple of the boys, and we continue into the pastor’s main living area that has a table set for our lunch. On the walls are pictures of religious leaders, including Pope Francis. The pastor has bookshelves stacked with literature on religious practice, language books, and other materials. Set on the table alongside the plates is a small speaker. The pastor turns on the speaker, raises the volume, and The Beatles’ Let It Be fills the room. We tell him that we also love the Beatles, and the smile seen at the restaurant grows across his face as he gestures toward the food to help ourselves. The meal consists of corn on the cob, potatoes, salad, and rabbit, which the pastor raises at his house. We finish the meal, and the pastor tells us how happy he is that he met us. “Thanks be to God,” he says as he raises both his hands toward the ceiling. “Thanks be to God,” my friend and I say in unison as another Beatles song plays from the speaker. Her comment catches me off guard. How could the death of a woman from a preventable disease be the will of God? It isn’t the first time I’ve heard this in Mozambique. When someone passes of old age or disease or accident, it is common for the people to find their comfort in knowing it’s God’s will. While it’s easy to be cynical of this view (and many volunteers are), who are we to try and tell anyone how to find comfort, how to find faith? How are we supposed to be strong volunteers without faith in something? Having faith in the better, the stronger, the more righteous can guide our hands, our actions. Will we be able to work in cooperation with the many churches here to deliver beneficial health information? Information on prevention? Long-term behavior change? Perhaps the answer is simply: If it’s God’s will, it’s God’s will. A Peace Corps staff member assesses the projects planned and presented at the Community Health Project Design & Management conference in Nampula City, Mozambique. Half the room is made up of American (and one Puerto Rican) volunteers, and the other half is made up of our Mozambican counterparts. We enter the conference room for the start of a three-day training that promises to introduce all of us to project implementation in our communities, a topic that all of us need to understand as projects start to get off the ground. The all-Portuguese training begins, and I realize the importance of the situation. Roughly 25 years ago, this country was tangled in a civil war that crippled the country, destroyed infrastructures, and left emotional scars that still remain today. While not many people here openly speak about the war, it’s clear to see the effects on the developing country. However, one product of the end of this war was pure, and understandable hope for a brighter future for the country and its people. My counterpart is sitting next to me as we spend the day learning about the role of Peace Corps volunteers in Mozambique, developing goals and objectives for our plans, and starting to list out the activities which we are going to complete once we return to our sites. The American volunteers are familiar with this environment as we scoff at the pile of papers and handouts we receive throughout the day. However, to our Mozambican counterparts, the information is (mostly) new and (mostly) exciting, sparking an energy in the room that is hard to resist. A fellow PCVs counterpart is a community health worker. He lives a very simple life, but today he is attending a conference in an urban hotel surrounded by accommodations, intelligent discussions, and a bountiful supply of water and food. To say that he was elated would be understating it. He was completely and totally beyond himself. Literally, a world had been opened up to him. Not one of excess, but one of deserved recognition for the work that he and the other Mozambican counterparts do on a daily basis. While employment is hanging over every conversation with volunteers as the country faces high unemployment, especially in rural areas, he sits in his seat for the remainder of the training with a smile across his face and a shirt nicely ironed and buttoned all the way to the top. We spend three days exchanging ideas, mapping out our activities, and providing advice to one another. While us Americans see this as a normal, everyday brainstorming session, Mozambicans embrace this dialogue as the new foundation to their newly developed home. These conversations provide them a glimpse into a world that is not fully their own but, at the same time, just within their reach. A world of community health and progress. A developed world. I share a table with my counterpart, and he is also elated. He speaks up often, shares his insights, thanks for me bringing him to this place where he is learning much. As an unemployed member of our shared community, my 28-year-old counterpart, Ivan, thrives on giving back and offering his hands and heart. He describes to me in detail during a lunch break that his last name isn’t actually his last name, as his parents disappeared when he was very young, leaving him to grow up in an orphanage. When asked about his parents, he only knows that someone told him his parents were taken away with the trash. Today, he’s advocating for youth and health in our community. He is engaging in difficult conversations to move the efforts closer to success. At the conference, he develops a plan to work with the HIV-support groups in our town to raise chickens for sale, gaining money for the groups and the promotion of support groups. We can learn something from Ivan and Mozambicans: conversation with peers about moving forward should be our constant motivations in life. Why can’t we all see the bigger picture for the future of our own country? Instead of bowing our heads during brainstorming sessions, let us raise our fists and demand change. The conference asked us to design a project. However, the conference also asked us to be better listeners, not only to our own peers, but those on the outside who still have the motivation and energy to love more, push harder, and seek results. Ivan, as well as the other counterparts, receive certificates for their work during the conference. A piece of paper to us, the next step in changing their home for the better to them. Ivan with Peace Corps staff receiving his certificate for completion of the training. Today was the first meeting for our new health journalism group we are starting in the community to provide practical writing and speaking skills to teenage students in Mozambique. After explaining to the students that they would not be learning English in the group (“the people who we will be helping and listening to in the community don’t speak English, so why should we?”), we started with a (seemingly) simple question: What is journalism? The translation of the answers is: organization, messages, information, words, collect, organization (x2), means. I wanted to see where the knowledge ﻿of the students landed, and me and my counterpart helping with the group were happy with the results! The collection of information and the use of messaging seemed well known to them. We are on the right track. We finished the hour-long group with a game of the human knot (header photo); however, explaining the game in Portuguese proved more difficult that first expected. The students locked hands but started to spin in a circle as a group. After a few attempts, we broke up, collected contact information, planned the next meeting, and dismissed. We hope to connect the group with this blog to provide an avenue for the students to share their thoughts, their findings, their lives with people around the world. This is an ongoing series and will result in a better understanding of Mozambican youth through health, journalism, and cooperative learning. Chilling and devastating account of family, education, and mental health in our current landscape. My heart goes out to the silent sufferers who wish to share their knowledge with others but don’t know how to quite solve their own mysteries. An important story, and one that I share with a heavy heart for this teacher. With Peace Corps Week in full steam and Michelle Obama’s declaration for more opportunities for girls around the world, I’m thinking back to my first two months with my homestay family, who provided me so much without them ever really knowing or understanding why. It’s simple for me to say, “I appreciate everything you’ve done for me,” but it’s harder to show them how deeply their love for a stranger, a foreigner would shape the rest of my service, or how I view Mozambicans and my purpose of being here. When you are only able to communicate through non-verbal gestures, especially in the first two months with a new language, it’s difficult to explain the impact of a positive homestay experience. So, instead, we danced and played. Usually my days were filled with training and language, but during the evenings and weekends, my sisters and brother would pass the time with listening to music and dancing in the kitchen or on the veranda, much to my host mother’s amusement. Together we developed a beat-box rhythm that all the neighborhood children would sing as I walked through to my house. Without audio, it sounded a lot like boom-chicka-chicka-boom-boom, but with more bass and the backdrop of the rolling hills of Namaacha in southern Mozambique. Wilson, my brother, was best at laying down the beat, and my sisters, Ester, Diana, and baby Ayume, filled the air with high laughter and enormous energy. Ayume slapped her hands together or against the table to try and keep the rhythm. Little do they know – I speak to them when I can, which is far in between – that the time with them has shaped my perception of the people here, the country, and my role. They are forever in my heart and mind as I journey into the unknown of service. The beat is always in my heart, and I look forward to new rhythms, new moves. 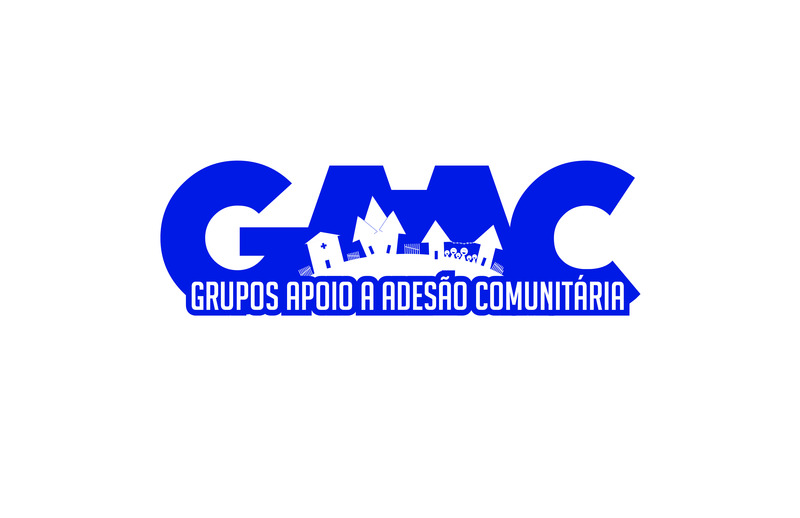 The GAAC (Grupos Apoio a Adesão Comunitária, or Support Groups for Community Adherence) program is booming across Mozambique, and for good reason. Still in its infancy, the program is designed to reduce high levels of patient abandonment rates by establishing support groups in the community for patients living with HIV and on ART (antiretroviral therapy) treatment and addressing the barriers to continued treatment. Five or six HIV patients from a similar area of town who have been taking ART medication for more than six months form a group with the help from staff in the hospital. When the group needs medication from the hospital, one member of the group is in charge of entering the hospital, visiting with the medical staff, and acquiring all the medication for every member of the group and then distributing it, reducing the number of patients waiting in the hospital and limiting the negative effects of stigma and travel costs. The program is extremely successful with plans to expand the program in more rural areas around the country. Designing has been a stress reliever of mine going back to the days of my advertising major at the University of Nebraska-Lincoln, where I completed designs for the Nebraska Alumni Association and Pinnacle Bank following graduation. When my interests switched to public health, my design work has mainly been for friends, family, and Etsy clients to scratch the itch. Here in Mozambique, designing is my link to my creative side, and I constantly search for ways to connect design, journalism, and health through my projects. 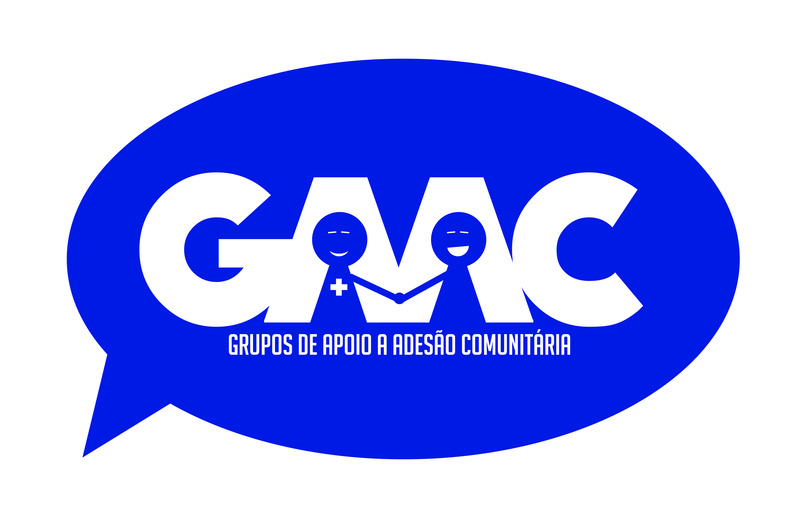 A fellow volunteer and an INGO asked volunteers to attempt a GAAC logo for the program. While these designs are basically just concepts right now, they have been sent to those in charge of the program for potential inclusion in printed material and promotional use. 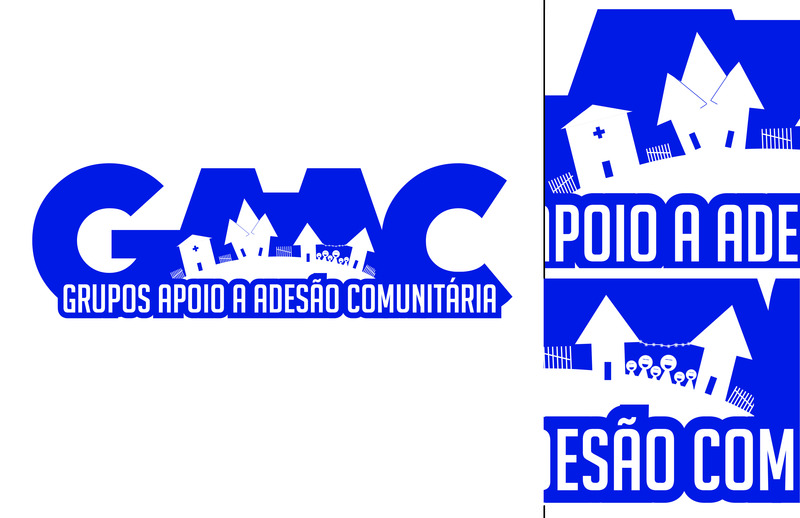 Below are initial ideas for the logo followed by the finished logo (also included at top). 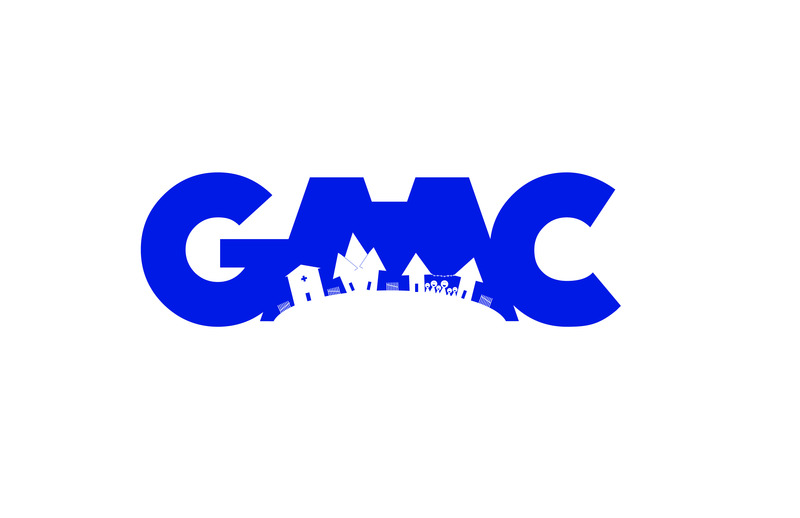 The idea of the two A’s as two sides of a pyramid with the arrows representing growth, progress, while also resembling two homes was an intriguing idea, but ultimately the obscurity of it would be too difficult for the average community member to see or understand. 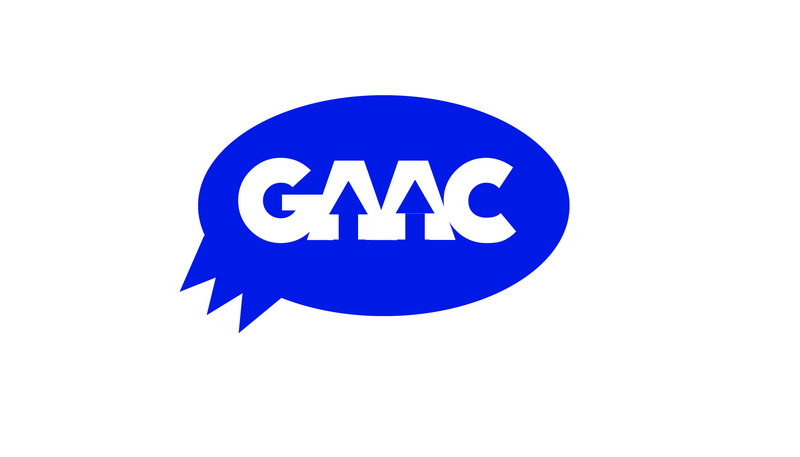 Since the program is basically advertised by word of mouth around the hospital and neighborhoods, the idea of a speech bubble incorporating the two arrows (as growth and homes) seemed on a better path toward the final logo design. However, the more and more I look at this, the more it feels like the GAP logo (=whoops). 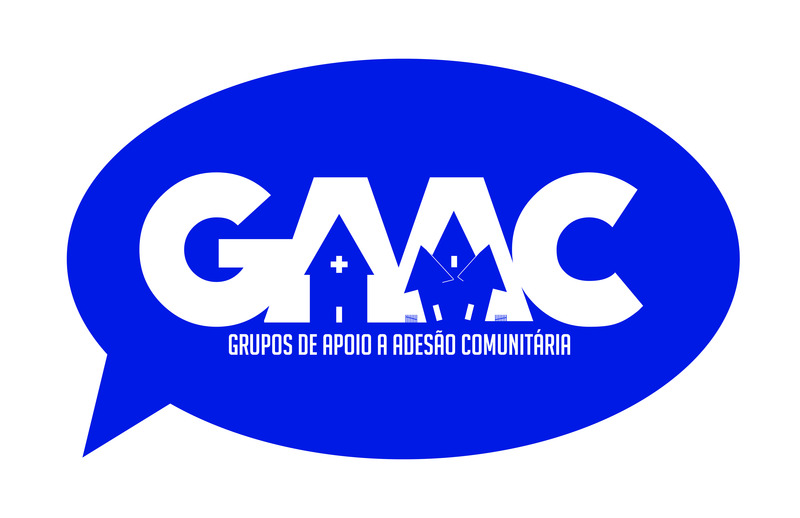 Using a similar design to the speech bubble one above, this design allows for better understanding through the use of recognizable symbols (cross for the hospital, houses bunched together and the fences for the neighborhoods), but it is still missing the key element that makes GAAC such a successful program: the human element. Pretty self-explanatory, but the inclusion of the people is easier to understand (also with the cross on the doctor/nurse’s outfit). Still, the design felt like it was now missing the community element, so it seemed like the best route would be to attempt to merge the two. Incorporating the community aspect (the hospital, houses) and also the human aspect (the party under bulb-light! ), this design is easier to understand as a community working together toward some common goal. However, since the program is still essentially new in the country, the letters alone don’t convey what the group is about. 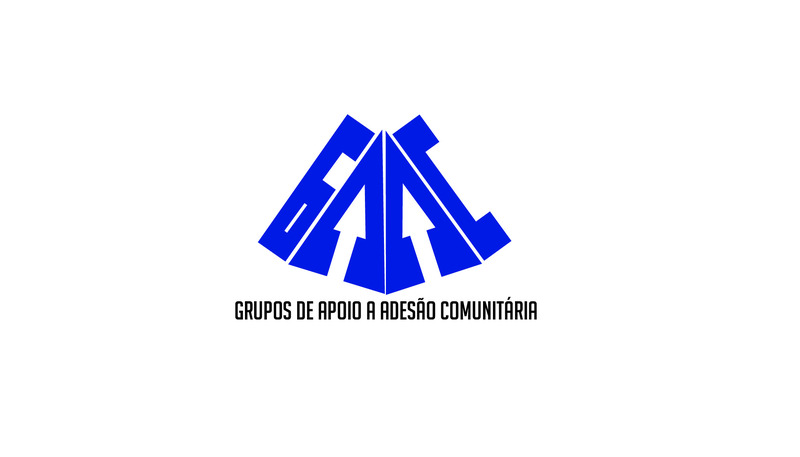 Using the same design from above, the inclusion of the explanation of the acronym provides a better understanding of the purpose of the program and highlights the importance of the word community. This final logo has been sent off for approval in hopes that it’ll be used to help promote the groups across the country. A friend of mine took a couple photos of the logos being used on promotional fliers in her hospital in the town of Macomia in Cabo Delgado province. A classroom at the Secondary School in Namapa, Nampula in Mozambique.